Expanding access to secondary school education is a key challenge in Sub-Saharan Africa, where school participation and completion rates have lagged behind other regions in the world. The challenge is particularly significant for girls, who tend to drop out at a higher rate than boys throughout Sub-Saharan Africa. Girls' lower educational attainment is often attributed to family decisions to invest more in sons than in daughters. Failing to develop the skills and earn the credentials to support themselves can have negative consequences not only for women's financial status but also their health. Many governments and NGOs try to encourage girls to stay in school by providing material support such as free uniforms and scholarships. Another promising approach may be to teach girls negotiation and interpersonal skills to help them advocate for their needs and goals. Recent neuroscience research suggests that interpersonal skills may develop during adolescence, so reaching girls at this developmental period may be key to improving these non-cognitive skills and enabling girls to better advocate for themselves.1 This research contributes to our understanding of household decision-making about educational investments, and illuminates a promising, non-financial approach to increasing investments in girls' education. Researchers conducted a randomized evaluation to measure the impact of a negotiation training and empowerment program on educational and health outcomes among adolescent schoolgirls in urban Zambia. 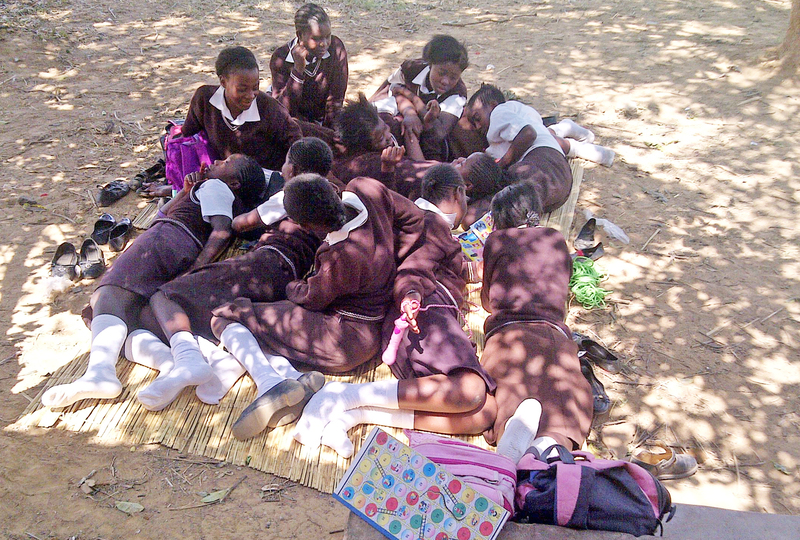 The program, called Girls Arise!, was developed in collaboration with the Ministry of Education, teachers from the Anti-Aids Teacher Association of Zambia, and a cadre of young university-educated women of backgrounds similar to students at the target schools. The negotiation curriculum was based on negotiation texts from U.S. business schools, and adapted for the Zambian context. Negotiation group (801 girls): Girls were offered the Girls Arise! curriculum from female Zambian coaches on negotiation and interpersonal communication during six after-school sessions over two weeks. The training included interactive lessons and role-playing games, and was designed to teach girls that compromises and solutions are possible when negotiating partners are willing to consider each other's interests. The curriculum also taught strategies to achieve those compromises. Girls received a free lunch on session days, a notebook, and pens. Two to three months after the sessions, all girls were invited to participate in a midline survey and a game activity with their parents, which was designed to reveal parents' decision-making processes related to investing in their daughters. In the game, parents made decisions about how to allocate ten tokens, which could be redeemed for mobile phone credit or other prizes, between themselves and their daughter. Aspects of the game were randomly varied among participants, including whether girls could communicate with parents before the parents decided, and whether girls could choose to send back some tokens to their parents. In total, seventy percent of girls and their parents attended and participated in the survey and the game. Girls with higher ability, measured by their ability to speak Nyanja and English well, were more likely to attend. During the midline survey, researchers also tested the girls' knowledge of negotiation skills. To measure long-term effects on health, education, and life choices, researchers collected administrative data on outcomes such as school fee payment, attendance, grades, enrollment status, and pregnancy status for up to three years after the training ended. Overall, the negotiation training improved girls' negotiation skills and significantly improved girls' welfare outcomes, particularly among girls with higher ability. Girls' knowledge of negotiation: The negotiation training was effective in improving girls' knowledge of negotiation. Several months after the classes ended, girls in the negotiation group scored substantially better in their understanding of negotiation tactics than girls in the comparison group. Girls' educational and pregnancy outcomes: The negotiation training significantly improved girls' welfare outcomes, driven largely by improvements among girls with relatively higher ability. Relative to the comparison group, the negotiation training improved girls' welfare by 0.053 standard deviations on an index measuring whether the girl had ever been pregnant as well as educational outcomes including school attendance rates and national exam test scores. For comparison, having a biological mother who completed secondary school, relative to primary school, had an effect of similar magnitude on these outcomes. Neither the Safe Space program nor the information session had any effect. The effects of the negotiation training were strongest among girls with higher ability, suggesting that girls with higher potential returns to education, who were on the margin of continuing schooling, were best able to change their parents' investments in their education through negotiation. Parental investment in girls: Results from the investment game demonstrated that girls who received negotiation training were able to improve their welfare when they could communicate with their parents, suggesting that the training helped girls influence their parents' decisions. When girls who received negotiation training were able to communicate with their parents in the game, parents chose to send them more tokens. These girls were able to influence their parents' decisions by increasing their parents' expectations of reciprocity; girls in this group sent more tokens back to their parents. These results suggest that girls who received negotiation training where able to use their negotiation skills to ask for more from their parents, but also reciprocate and repay them. Survey results demonstrate that negotiation-trained girls were more likely to ask for more food and more willing to do chores in the household. This suggests that this type of give-and-take enabled the girls to benefit from extra educational investments from their parents. Importantly, parents were no more likely to report that their negotiation-trained daughters were disrespectful or rude, indicating that the training did not negatively affect girls' relationships with their parents. Based on these results, the Zambian Ministry of Education Curriculum Development Center introduced a revised life skills and sexual health curriculum for multiple grades throughout the country. A summarized version of the Girls Arise! curriculum was included in the revision, reaching all grade 8 pupils in government schools beginning in early 2016. Researchers have also made the curriculum freely available for download so that it can be incorporated into existing life skills, HIV prevention, and girls' empowerment programs. Nava Ashraf, Natalie Bau, Corinne Low, and Kathleen Mc Grinn. "Negotiating a Better Future: How Interpersonal Skills Facilitate Inter-Generational Investment." Working Paper, May 2018. 1Choudhury, S., S.-J. Blakemore, and T. Charman. 2006. "Social cognitive development during adolescence." Social, Cognitive and Affective Neuroscience 1(3): 165-174.